The moment's finally arrived, and we're now broadcasting from our brand new studio on London's Leicester Square. Take a look around as we capture this morning's first broadcast. The lights look great, and we're all kitted out with fantastic new equipment - and John Suchet's looking pretty pleased too! Colours, lights, and screens aplenty, we have to admit, we're pretty pleased with how the new studio is looking. There's a lot to keep track of in the studio: Twitter, Facebook, emails, phone calls - not to mention the music we're playing! Luckily, there are enough monitors to help us keep an eye on things. Preparing for the 9am news bulletin, Bill Overton is the first person ever to broadcast from the new studio. It's Classic FM's version of mood lighting. The microphones are on, and the green lights give way to reds and pinks to show we're broadcasting live. No, we haven't left a whole load of brand new equipment out in the open - it's an incredible projection of the sky above the studio. Everything's set up, and when the lights go red, the microphones will be live and Classic FM will be broadcast across the UK from our brand new studio. It's almost 9am, when Classic FM will be broadcast from the new studio for the first time. Bill Overton prepares to deliver the latest news ahead of the Hall of Fame Hour with John Suchet. John's ready to go - notice how the room has changed colour? The lights change when the microphones are live! Even if it's grey outside, the presenters are lucky enough to be working under a bright blue sky. It's just after 9am, and time for the Hall of Fame hour with John Suchet. A series of screens around the walls keep the presenters and producers firmly to time. We've got a host of new equipment too! The Hall of Fame Hour has gone off without a hitch, and it's time for three hours of John Suchet's morning show. What's your favourite radio station? TV screens around the studio serve as a helpful reminder. Nick Bailey - the first voice to be heard when Classic FM started broadcasting in September 1992 - feels immediately at home in the new on-air studio. Classic FM presenters Nick Bailey and Jamie Crick enjoy their first encounter with the new Classic FM on-air studio. Classic FM news reader Alastair Yates presents his bulletin from the new on-air studio. Anne-Marie Minhall sends Jamie Crick a request from her laptop to see if all the technology is working in the new Classic FM studio. Jamie Crick, standing right, is joined by newsreader Alastair Yates, left, and producer Jamie Beesley to get Classic FM Requests on the road in the new Classic FM studio. Jamie Crick explains the ins and outs of the microphone in Classic FM's new on-air studio. Classic FM presenter Anne-Marie Minhall is delighted to be presenting in the stations new on-air studio. Jamie Crick presents Classic FM Requests from 1pm - 3pm every weekday afternoon. The technology in Classic FM's new on-air studio keeps him abreast of all your requests, as they come in. Nick Bailey is on air from 2am-6am every weekday morning to bring you the most beautiful classical music through the early hours. The new Classic FM studio keeps him relaxed - but thankfully awake. Classic FM's new on-air studio features state-of-the-art broadcasting technology under a brilliant blue sky. Classic FM presenters Jamie Crick and Anne-Marie Minhall are chuffed to be working in Classic FM's spectacular new on-air studio. Anne-Marie Minhall takes control in the new Classic FM studio. 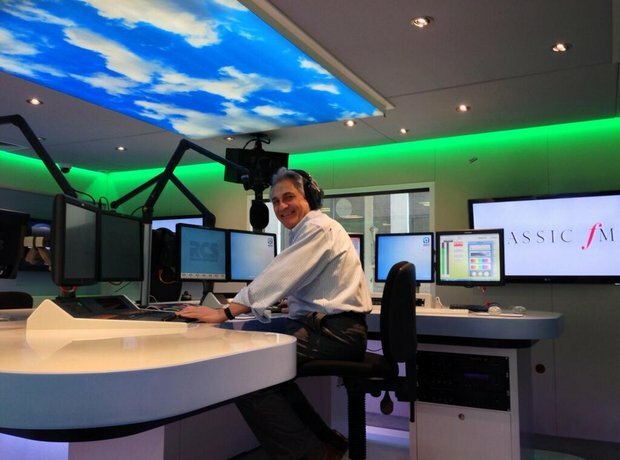 The sky's the limit for Classic FM presenter Jamie Crick as he gets to grips with the station's new studio.